As the fourth employee of HubSpot, it only took now-CRO Mark Roberge seven years to scale the company to $100 million in revenue with 450 sales and service reps.
Mark recently presented at the Sales Acceleration Summit, hosted by InsideSales.com, to explain how one of the key elements of that success was implementing a culture of sales coaching. “If you bring in highly coachable people into an environment of world-class coaching, you’re going to create success,” Mark said. But that all starts with knowing how to hire sales reps who respond to and learn from sales coaching. Mark shared his secret sauce for doing just that. Mark explained that hiring for coachability starts with identifying your ideal hiring profile. For Mark, the interview starts in the lobby when he meets the candidate. If they recently graduated, he’ll ask about what the candidate did in college. He asks what their passions were and how they excelled at those to measure prior success. The biggest of Mark’s interviews is the role play to assess coachability. He sets up a hypothetical situation where he’s an inbound lead. Then, he stops the role play mid-interview. “I say, ‘OK, how do you think you did?’ And if they’re like, ‘I was awesome,’ I’m just not psyched about that. But if they’re really perceptive and reflective about how they did…that’s an enormous indicator for me, and I’ll build off of that. Then, Mark has them redo the role play. Mark also talked about how to bring new sales reps into a highly coachable culture and model. His full presentation is available for the next two weeks only by registering for the Sales Acceleration Summit. 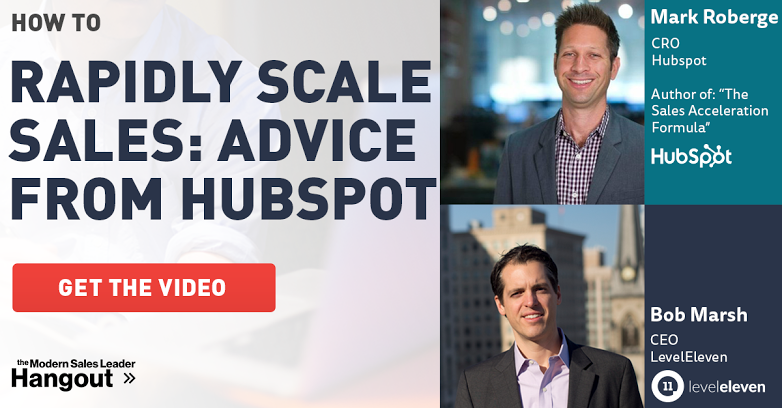 Or you can check out what Mark told us about rapidly scaling a sales team any time by downloading the video of the most recent Modern Sales Leader Hangout broadcast. HubSpot CRO Mark Roberge credits much of the company's growth success to a good strategy for how to hire sales reps that can be coached.